Similar to Track and Field meets, velodrome races offer spectators a wide variety of events to watch. Each event is unique and presents its own set of physical and mental demands. 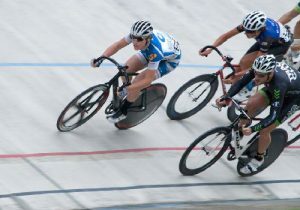 Unlike track and field or swimming, velodrome racing at the DLV is unique because all riders must compete in each scheduled event; sprinters must figure out a way to finish endurance events and endurance riders must outsmart the sprinters in a short, fast race. All weekly and Grand Prix races are “Omnium”-style events, a series of races worth points. The winner is the rider who accumulates the most points after all racing is done. Depending on how other riders place, it’s possible to win the Omnium without placing first in any of the races. The simplest of races. After predetermined amount of laps, the rider who comes across the finish line first on the final lap wins. Typically ran two ways: very raw and short to seed riders for “Match Sprint” heats or very long and tactical (similar to NASCAR or INDY style car races). In the longer version, riders try to break away from the group while teammates try to slow the field or make other teams work. The split scratch is a combination of a points race (see below) and a scratch race. There is a mid-race sprint that scores 4 places deep, 5,3,2,1 points. The final sprint scores 6 places deep, 9,7,5,3,2,1 points. The rider with the most points scored wins the race. Scratch race rules apply for laps gained/lost, tie-break is determined by the results of the second and final sprint. The Win and In is 15 laps long with sprints every 3 laps (5 total). The winner of each sprint “qualifies” for the final. Once the 15 lap portion is completed, the field exits the track and the five qualifiers are given three laps to go. Riders can attempt to win more than one qualifying sprint to reduce competition in the finale. If this happens, the results of the sprint at the end of the 15 lap regular race portion determine the final places to score points towards the night’s omnium. The Point-A-Lap is a tactical nightmare because it’s usually a medium distance event meaning it doesn’t favor sprinters or endurance riders. The leader of each lap, and only the leader, scores one point per lap with the exception of the final lap. On the final lap, the leader earns 3 points, second place earns 2 points, and third place earns 1 point. The rider with the most accumulated points wins. Like in the Point-a-Lap, only the leader of each lap scores points, but the points increase in value as the race progresses. Winning lap one earns you 1 point while winning lap ten earns you 10 points. Unlike the Point-A-Lap, the snowball does not place three deep on the final lap. In the event of a tie between riders, the rider who places better in the final sprint breaks the tie. The shortest group race that we do at the velodrome, the chariot is just one lap long. Up to 7 riders line up side by side on the pursuit line and are held upright by holders. When the gun goes, it’s an all-out dash for the line. The key to being good at this race is a great standing start and top-end speed. This race is the shortest, fastest, and ironically the slowest event on the track. Often described as a chess match on wheels, the match sprint is a display of tactics and speed. Riders compete in a 3 lap race. Unlike sprints in running, cyclists do not have to remain in designated lanes and can use the entire track to maneuver for position. 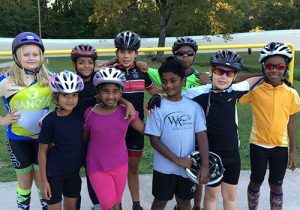 This enables them to take advantage of the tremendous drafting effect by riding in other riders’ slipstreams. For this reason Match Sprints usually begin very slowly until a rider makes a strategic “attack”. Some racers prefer being out in front to get a good “jump” on the competition. Others prefer being in second position, while taking advantage of the slipstream and saving energy until they make their move in the last few meters. To do this sometimes riders will come to a complete stop and “track stand”, which is balancing your bike without your feet coming off of the pedal or rolling backward, forcing the other rider(s) to come ahead of them and take the lead. Doing this makes the race sometimes the slowest race and at the same time very exciting. The match sprint is always a crowd-pleaser. Sometimes Match Sprints are run on tandem bicycles and is a very popular Paralympic event. Racing behind a motorcycle sound like fun? The Keirin is run usually in heats of 5-8 riders who follow a motorcycle that allows the riders to draft off of it. The pace gradually gets faster and with 1 1/2 laps to go the motor bike pulls off and the sprint begins. This race is very very fast and very very dangerous, with speeds easily approaching 40 mph! During the Keirin riders jockey for position and will bump, head but or do just about anything to get the position they want. In Japan, Keirin races are run with riders wearing shoulder, elbow and hip pads. The races are bet on and are so popular and so competitive that riders during large events have to be hidden from spectators to keep the riders from being bribed or worse. Only baseball is more popular. Easily the crowd favorite… this is an elimination race where the last rider on every lap is “pulled” from the race. The race takes place at the back of the pack, as one by one the rider whose rear wheel crosses the line last is eliminated. This can get hectic as riders fight desperately for position. This race is also known as “DEVIL TAKE THE HINDMOST” as occasionally a rider/riders like to play the “Devil”. The devil likes to stay at the back of the pack until the final few meters of each lap, then eliminating an unsuspecting opponent at the last moment. The race continues until there are only three riders left, and then a sprint to the finish. The Madison is named after Madison Square Garden and is similar to the points race, except the field is made up of teams of two riders who don’t race at the same time. During the event one rider stays above the “Stayers” line (Blue line on the track) or hangs on to the side of the track while their teammate races around the track, when a rider wants in to the race or out of race for a breather, the one rider racing will come up on the other rider and “Hand Sling” him in to the race. The hand sling is literally slinging or throwing the other rider in to the race. Using a hand sling allows the new rider to get up to speed faster. 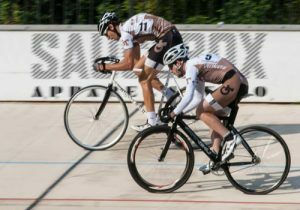 Typically the team will have a sprinter and an endurance rider so the endurance rider will sling the sprinter hopefully in to the race on a sprint lap. Sometimes, however, riders can’t make the exchange and must continue for additional laps or try to sprint for points. In Europe this is one of the most popular sporting events.